Braydon Moloney took up a Science Communication Fiordland Film Scholarship with DOC at the end of last year. 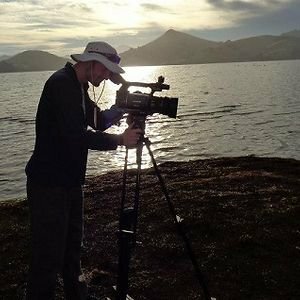 This offered the University of Otago student—studying for his Masters in Natural History Filmmaking at the Centre for Science Communication—support in the making of a conservation themed film. His 25 minute documentary “Pest Free?” is due to premier in Dunedin in early November. It addresses the question, “can New Zealand become pest free?” and looks at what it means to be pest free, what’s currently being done, and where the future is headed. Today we have the privilege of checking out a short “demo reel” for the film. Applications for the Science Communication Fiordland Film Scholarship are always welcome. The support offered is negotiable on receipt of an application. It may include: covering costs associated with accompanying DOC field trips, accommodation and other travel expenses; general logistical support, including interviews and technical information; and exclusive footage opportunities. For further information, please contact Caroline Carter.